An eclectic mix of spirals, diamonds, and squares cover this short bag or rune pouch, revealing symbolism used in ancient artwork. 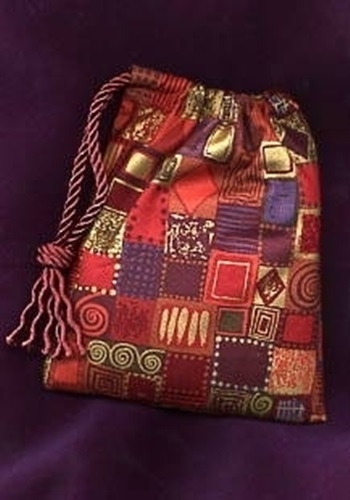 Earth colors � copper, orange, light brown, rust, metallic gold, moss green, and blue violet � make this bag a great home for gemstone rune sets, collection of healing crystals, or small tarot decks like Tarot of White Cats Mini deck. Brilliant gold metallic highlights add a special magical touch to this unique rune pouch. Symbolism: The spiral, as an artistic symbol, has been used since Paleolithic times but is particularly prominent during the European Bronze Age (circa 5,000 - 500 years ago). The spiral appears in nature over and over again, from fierce tornadoes to common snail shells. It symbolizes power in potential, forces waiting to unfold, and the great creative forces of ebb and flow. The diamond is a precious gem created from roughness, a light coming from darkness, symbolizing transformation and truth. The square represents stability, balance, and integration. These elements placed together creates a dynamic force. Size: Measures approximately 5" wide by 6" inches tall (12.7 x 15.3 cm). Fits rune sets and most small card decks (2.75" x 4" and smaller).